Around this time of year is when the gardens of green-thumbed people (that would not be me) become a bit overrun with zucchini. 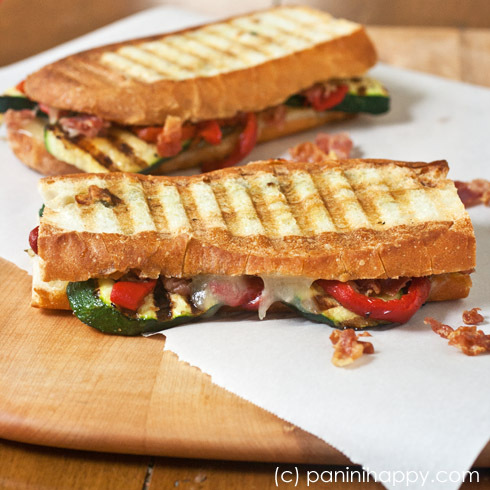 If this predicament sounds familiar to you, I’ve got a recipe you’re sure to love: Grilled Zucchini, Crispy Prosciutto and Red Pepper Panini. My challenge with these panini actually wasn’t to use up zucchini (I wish I were that skilled as a gardener!) 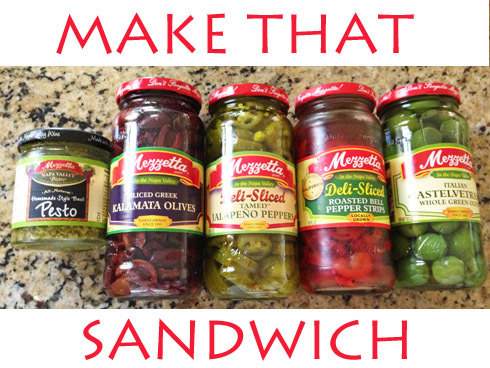 but to make an incredible sandwich using at least two of the products that Mezzetta makes (I used the roasted red peppers, basil pesto and Italian olive oil), to help spread the word about their “Make That Sandwich” contest that’s currently underway. I’m not eligible to enter, but perhaps a Panini Happy reader will take home the $25,000 grand prize??! Find out more information about the contest here. Summer zucchini, which tastes almost meaty in these sandwiches, is the star here but the supporting lineup isn’t far behind. I matched it with roasted red peppers, Manchego cheese (my favorite! ), pesto and crispy prosciutto on a baguette. Let me tell you about this prosciutto – when you crisp it up it comes out like super-light, melt-in-your-mouth bacon. I swear, a bowl of these little curled up strips could be an appetizer on their own, they’re so addictive. Mezzetta would like to send one lucky Panini Happy reader a selection of their condiments to help you make your own flavor-packed panini at home (or to enter the Make That Sandwich contest!). To enter: Leave a comment on this post, telling us your best memory from this summer so far. The giveaway will close on Monday, August 5, 2013 at 12:00 PM PDT. I will use random.org to select one winner and announce the winner in this post. I will contact the winner via e-mail – if I don’t receive a response within 5 days I will draw another name. My apologies to my international readers, the prize can only be shipped to U.S. addresses. ** UPDATE 8/7/13: Congratulations to our winner, #35 Madeline! Heat 1 tablespoon of olive oil in a large skillet over medium-high heat. Add the prosciutto strips and cook them, stirring occasionally, until they’re lightly browned and crisp, 2 to 3 minutes. Transfer the prosciutto to a paper towel-lined plate to drain. Place the sliced zucchini into a large, resealable plastic bag. Add in the remaining 1 tablespoon of olive oil, salt and pepper. Seal the bag and roll the zucchini around inside until it’s well coated in the oil and seasonings. Arrange the zucchini slices on the grill and close the lid. Grill the zucchini until it’s tender and grill marks appear, 4 to 6 minutes. For each sandwich: Slice off the domed top of a baguette portion to create a flat grilling surface. Split the baguette to create top and bottom halves. Spread a few teaspoons of pesto inside each baguette half. 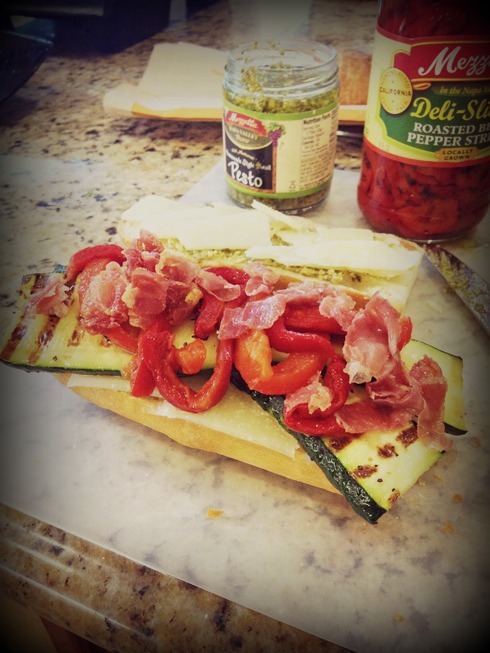 On the bottom baguette half, layer a little bit of cheese, zucchini slices, roasted peppers, a handful of crispy prosciutto and more cheese. Close the sandwich with the top baguette half. Grill two panini at a time, with the lid closed, until the cheese is melted and the baguettes are toasted, 4 to 5 minutes. I’ve heard such great things about the food scene in Asheville! So far this year, my best summer memory is spending a day at a local amusement park with the whole family – haven’t done that in years. 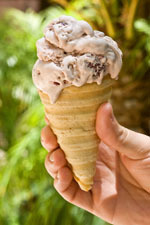 Perfect weather, yummy treats and seeing my kids whiz by on roller coasters was tons of fun! Already an email subscriber – thanks! Playing baseball with my nephew for the first time! My best memory of summer so far is trying on my wedding dress! Oh wow…that’s so exciting! Congrats to you!! Best Memory so far – tubing down the river with my partner and friends! Making Plum Barbecue sauce with my boys, it was so much fun.. I am an email subscriber for a while now. My best summer memory thus far had to be taking my son out to blow bubbles when it was just too hot to stay indoors and him saying his first word. (Bubbles.) He has a hard time with speech so this was a HUGE deal, something that I will never forget. My best summer memory so far was learning to swim! Congrats on that achievement! I’ve had my kids in lessons this summer, but I really need to get some myself. Great post! I love grilled veg sandwiches and often order them at restaurants. I think maybe my best day so far this summer was just this past Monday when we found out for sure we’re selling my husband’s house this week. It has been a doozy of a summer trying to sell that danged thing but it will finally be gone in two more days. Yay! My friends and I had a Nashville-style hot chicken (http://s.shr.lc/15cgSZ1) festival. That definitely sounds memorable (and tasty)! My greatest memory for the summer, thus far, was being at the filming of the new and upcoming movie “Blended” starring Adam Sandler, Drew Barrymore, Bella Thorne and Shaquille O’Neal. My daughter and I met and took pictures with Shaq, Bella and Adam. The film will air May, 2014. It was filmed in our town. 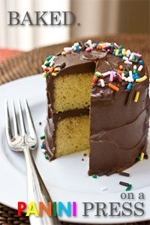 Have a great foodie day! I am an Italian who loves Mezzetta products! I just subscribed to the email list. Trip to California with the whole family was so fun. The highlight would be paddleboarding in Newport Beach, and Catalina Island! That sounds fantastic. I haven’t been to Newport or Catalina in years, and I need to – so beautiful up there (and only an hour or so from us!). My favorite memory so far is my vacation where I spent a week at the beach with my husband and family. Sleeping in, playing in the waves, eating fresh fish for dinner – perfect! And I already subscribe to your emails! Wow. My favorite summer memory (so far, summer’s not over!) is going on a last-minute road trip to Jacksonville, Florida with a new friend. Aaand… This panini looks GREAT. I’d love to win some of those Mezzetta items. Pickled anything rocks my world. As do bread, cheese and meat! I went to visit my friend in another state! Riding waterslides with my son at the local waterpark. We had some friends over for a barbeque. It wasn’t big; just six of us, but it was good times. Already subscribed, and btw, this sandwich looks too good! My best summer memory is taking a ride to Niagara Falls with family. Lovely panini recipe. I loved the grill marks on the bread. The filling is surely delicious, with the prosciutto! So far this summer has been uneventful. Going on a fourth of July roadtrip with my hubby! Incredible! I love the flavor combination here 🙂 prosciutto is my favorite! The best so far was being by the lake and watching my niece feed the ducks; I gave her an entire loaf of my french bread! Has a winner been chosen yet? Yes – please see the update at the end of the post. Thanks! 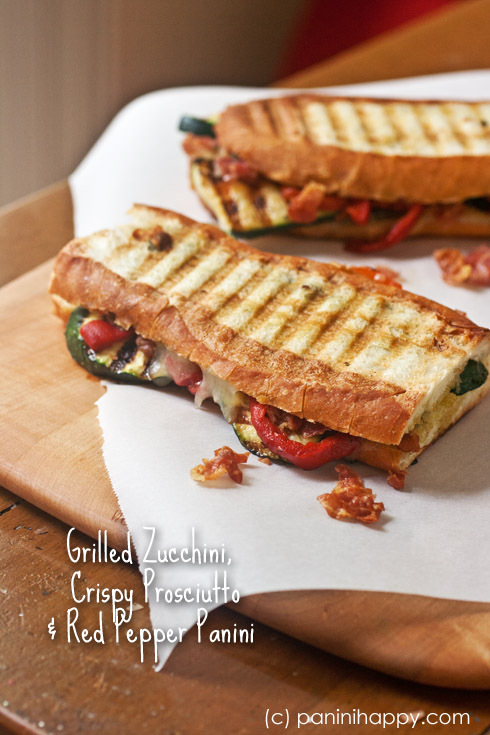 Those are some really tasty looking paninis!